After dominating the early part of the 2011 Formula 1 season, Sebastian Vettel had been going through what can constitute as a slump. At the past grand prix at German's Nurburgring circuit, Vettel started 4th place in the #1 Red Bull-Renault for what was his worst grid position for the 2011 season. Maintaining Red Bull Racing's undefeated streak in qualifying for the British and German Grand Prix was Vettel's teammate Mark Webber. As Sebastian Vettel leaves his home grand prix in Germany with a less than spectacular result, the reigning world champion in the Formula 1 series could have a new sense of purpose entering Budapest for the Hungarian Grand Prix. An intense battle during Saturday qualifying saw drivers of Red Bull Racing, McLaren F1 and Scuderia Ferrari clamouring for the pole on the tight 4.381 kilometer Hungaroring track. After the Q2 session in Formula 1 qualifying for Sunday's race, the Ferrari of Fernando Alonso posted a 1 minute, 20.262 second time around the track to lead at this point in time trials. Immediately ahead of Jenson Button and Mark Webber, Alonso held the benchmark into Q3 which was quickly eclipsed. Setting a time more than half a second faster than his Q2 session best around the Hungaroring, the McLaren-Mercedes of Jenson Button was 3rd fastest. In the second row, Button starts alongside the 4th place Felipe Massa's Ferrari and a grid row ahead of Massa's teammate Alonso. Showing strength of McLaren, Lewis Hamilton rose from 7th fastest in Q2 to 2nd quickest in the final Q3 qualifying. Hamilton's 1 minute, 19.978 second time was more than 1.2 seconds better than the previous session. 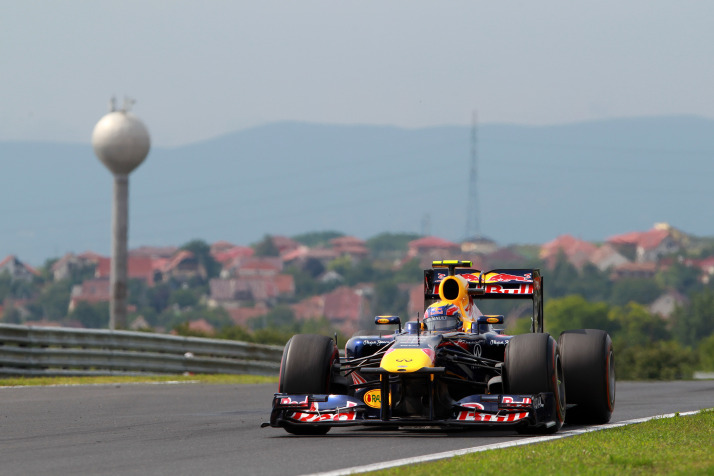 Starting from pole for the 2011 Hungarian Grand Prix is the Red Bull-Renault piloted by Sebastian Vettel. Setting top time in qualifying with a 1 minute, 19.815 second lap, Vettel like Hamilton made up considerable ground from Q2 to gain a front row spot for Sunday's grand prix. The Hungarian Grand Prix pole position for the German driver marks the 8th time in 2011 Vettel starts out front of a Formula 1 race. In the 7 previous outings where the #1 Red Bull-Renault started on the pole, Sebastian Vettel went on to win the grand prix 5 times.